If you arrived late for the match you would have missed all the action as the referee brought forward the kick off by 15 minutes and Marr so dominated the match that it was over by half time. From the kick off Marr took the game to St Columba. An early penalty was kicked to the corner and from the resultant lineout the ball was caught and driven before Jamie Drummond peeled off and crashed over the line. Beckwith kicked the conversion. 7-0. Marr continued to put the visitors under pressure and from a quickly taken tap penalty the ball was moved to Evan Light who went over in the left corner. 12-0. Matthew O'Leary then went over for a try in the opposite corner for an unconverted try. The next score followed sooon after straight from the kick off with Jamie Drummond crashing over for a try converted by Beckwith. 24-0. Marr were totally in control in every area of the game and from a scrum strike against the head on the half way line the ball was moved quickly to Light to score in the corner. Beckwith was successful with the touchline conversion making the score 31-0. A speculative cross field kick was gathered by Marr following a good chase and O'Leary burst through to score under the posts. Beckwith added the two points. Light then went over for his third try as a big tackle in midfield produced turnover ball which was capitalised on by Marr. The conversion was again made from wide out. 45-0. Marr continued to dominate territory and possession whilst sticking to their game plan. A penalty was kicked to the corner and from a driving maul Jamie Drummond again scored from close range. Beckwith kicked the conversion to extend Marr's lead to 52-0. Drummond then went on a sixty metre dash before being brought down. However, quick recycling allowed the ball to be moved quickly and O'Leary went over for his third try. Beckwith added the two points to extend the lead to 59-0. Finally good support work enabled Ethan Reilly to go over on the stroke of half time for a try which Beckwith converted to make the half time score 66-0. Under the competition rules when a team has a sixty point lead the game is drawn to a close so this was also the full time score. The under 18s were up for, what on paper, was going to be a tough match. However Marr controlled the entire half and did not allow St Columba's any opportunity to get into the game. 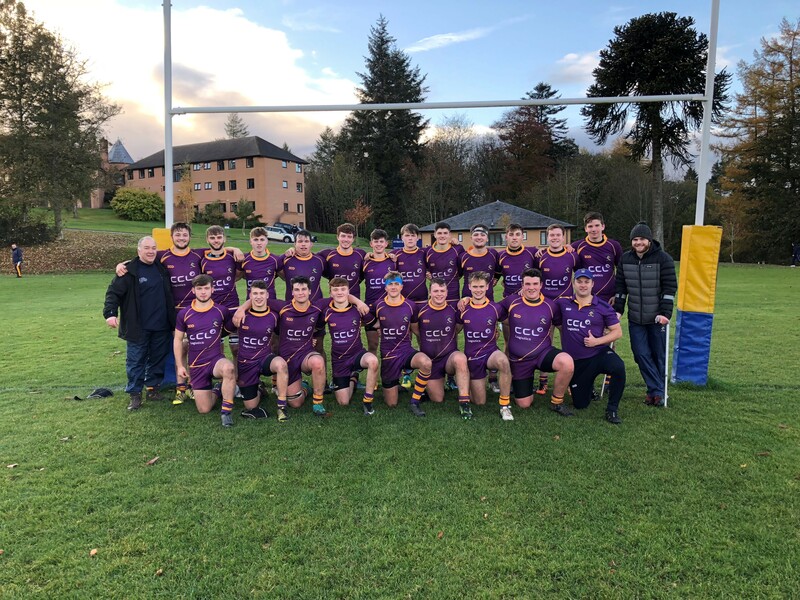 Next up the squad have two matches on Saturday – away to Carrick in the School Conference League and away to Bishopton in the Club League before travelling again next Wednesday to play Grange in the second round of the Scottish Schools Cup. There will be tougher games to come and we have to ensure the squad remain grounded and focussed on the task ahead.